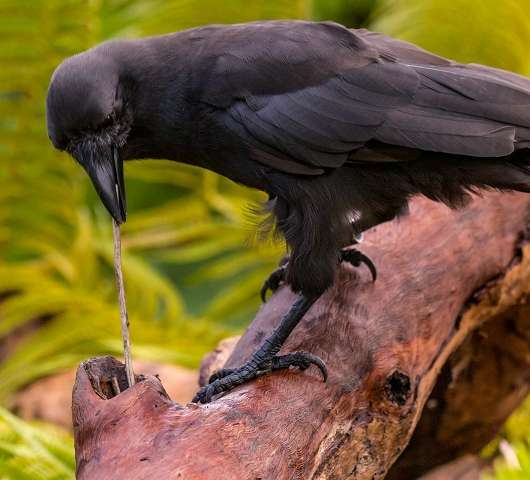 New research finds that the Extinct-in-the-wild Hawaiian Crow can teach itself how to use tools. Hawaiian Crows, also called ‘Alalā, once thrived in the dry and wet forest habitats of Hawai’i’s islands. The native birds preyed on invertebrates and also consumed the islands’ native fruits. Unfortunately, the ‘Alalā began to struggle for survival when habitat loss and pressure from invasive species caused a severe population crash. Now, the only living ‘Alalā are in captivity. A study published in Nature by Christian Rutz and others examines ‘Alalā ability to use tools to forage for food. Captive birds were presented with a wooden log with six extraction tasks. During experimental trials, birds routinely selected tools of appropriate dimensions, replaced unsuitable tools, and transported non-supplied sticks to the log. Tool modification occurred frequently. ‘Alalā demonstrated dexterity in using tools to forage and even showed capacity to manufacture tools out of plant material. The researchers reared seven juvenile ‘Alalā and presented them with foraging tasks. Almost all of them successfully utilized tools without having ever been shown or taught how. 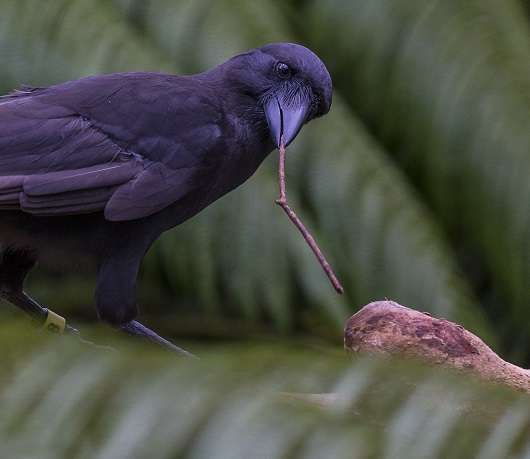 Before the study, Hawaiian Crows in the wild had not been observed using tools. 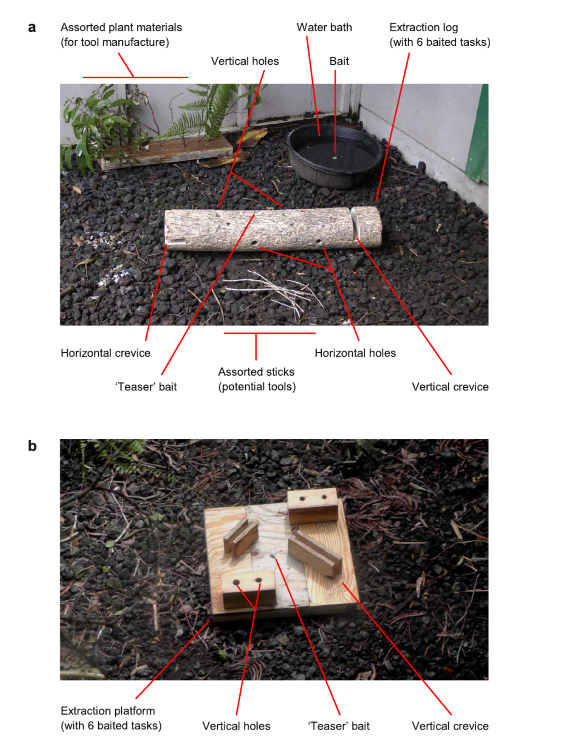 This supports the idea that avian foraging tool use is facilitated by ecological conditions typical of islands, such as reduced competition for embedded prey and low predation risk. The presence of invasive species therefore may have influenced ‘Alalā behavior such that they were discouraged from finding and using tools in the wild. Because the ‘Alalā were threatened by invasives in their habitat, they could not afford to become mentally absorbed in complex foraging tasks–such focus would make them vulnerable to nearby predators. The crows could not focus on a task if another animal was stalking them. The new research raises further questions about animal cognition and learning. Hopefully, with support from captive breeding and invasive species removal projects, ‘Alalā can inch away from extinction and we may continue to learn about this incredible, intelligent bird.